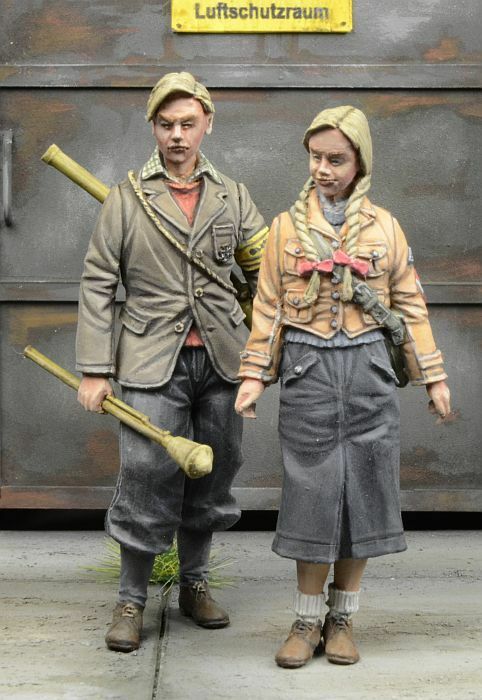 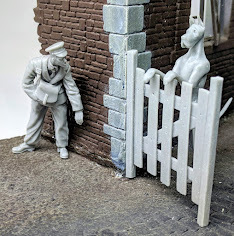 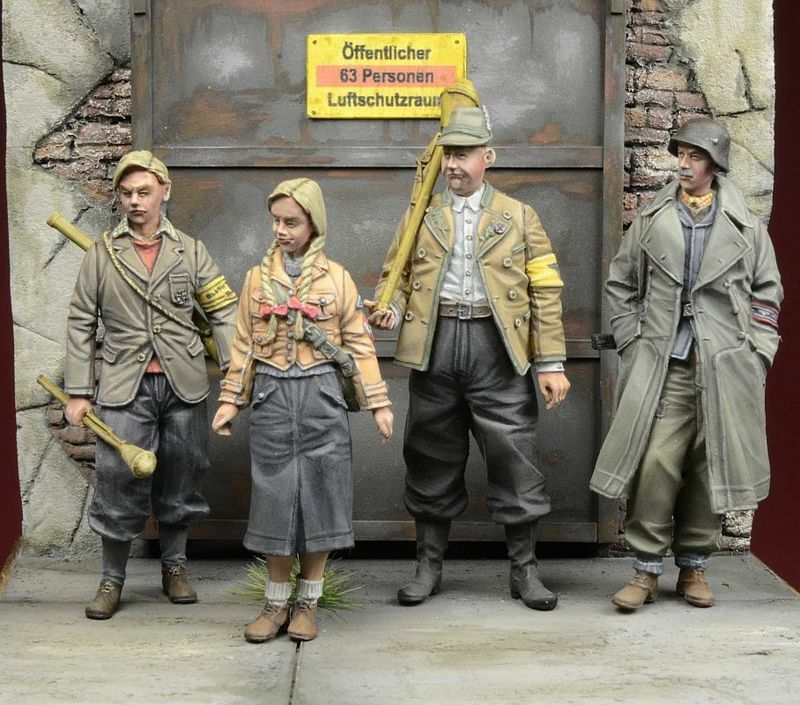 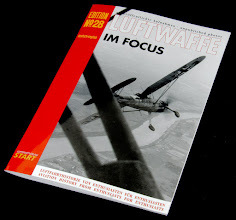 The Modelling News: The guys & girls of Germany's home guard in 1945 from D-Day Miniatures.. 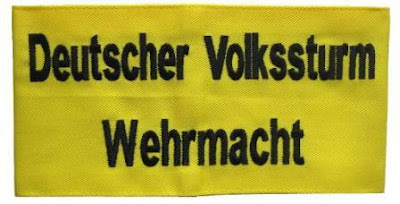 The Volkssturm (German pronunciation: [ˈfɔlks.ʃtʊɐ̯m], "people's storm" was a German national militia that was formed mostly in the last months of World War II. It was established by the Nazi Party on the orders of Adolf Hitler and its official existence was not announced until October 18, 1944. Males between the ages of 16-60 who were not already serving in the German military were conscripted into its ranks – often under force although sometimes civilians, male and female volunteered. 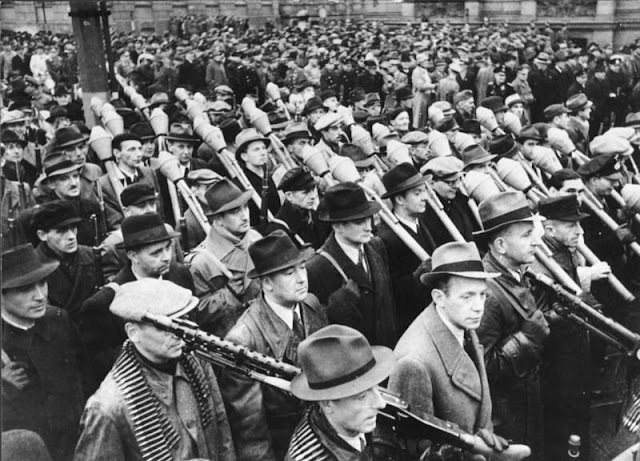 The organization of the Volkssturm in 1944 was meant to aid the dwindling military might of the Reich, but historians speculate it also kept civilian men watching the destruction of their cities from entertaining thoughts of uprisings. 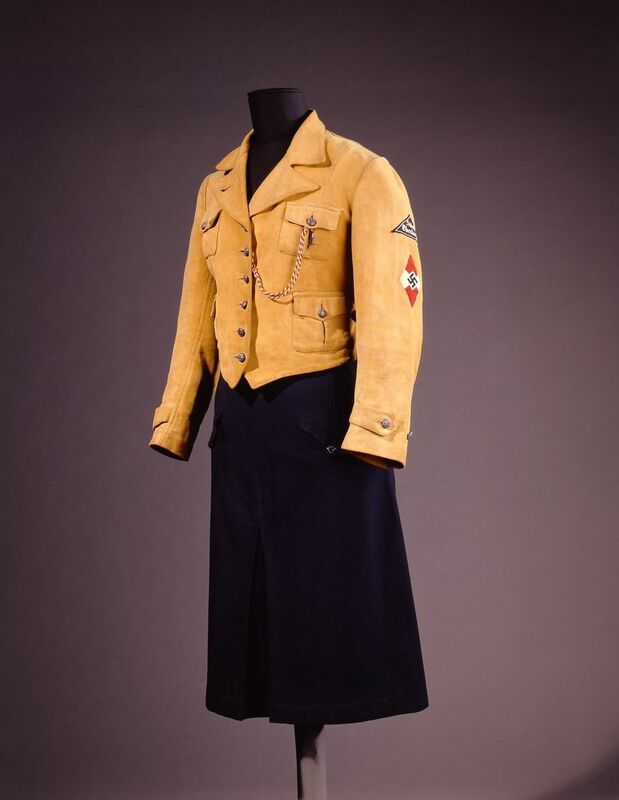 As we mentioned – not only men but Girls and old women served as well - the BDM or The League of German Girls or (Band of German Maidens in German: Bund Deutscher Mädel, BDM.) 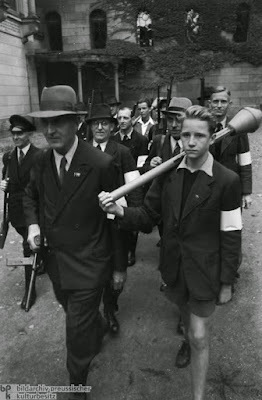 This was the girls' wing of the Nazi Party youth movement, the Hitler Youth and it consisted of two sections: the Jungmädel, or Young Girls' League, for girls ages 10 to 14, and the League proper for girls ages 14 to 18. 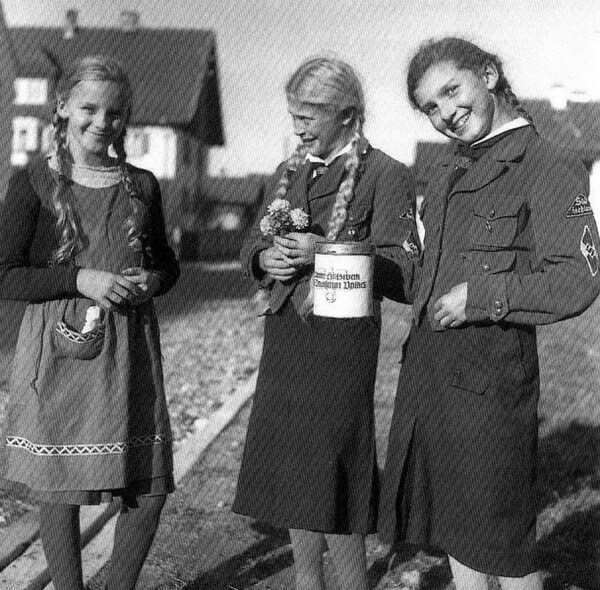 In 1938, a third section was introduced, the Faith and Beauty Society (BDM-Werk Glaube und Schönheit), which was voluntary and open to girls between the ages of 17 and 21. 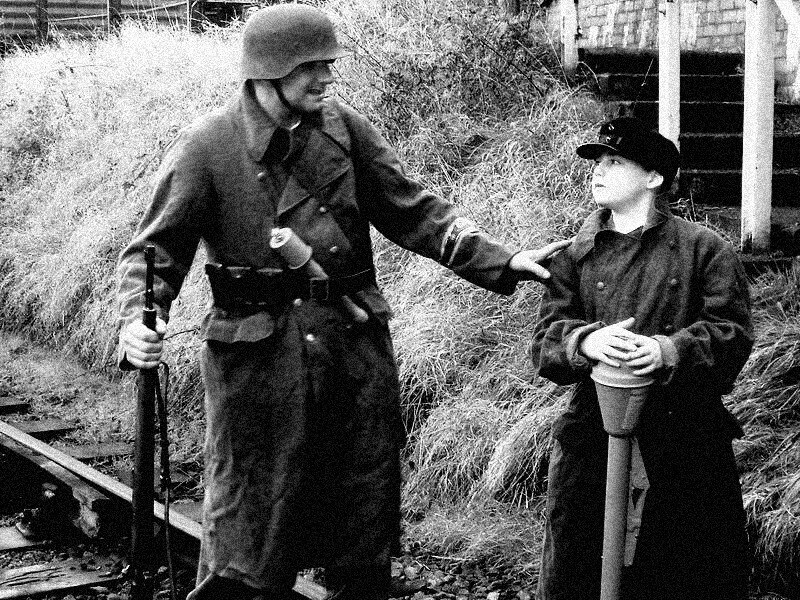 This young man is seen carrying the primary weapon for Volkssturm fighters – the Panzerfaust. 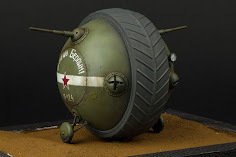 Cheap disposable and very effective they were the perfect weapon for young soldiers that needed to blend in to the background to escape the advancing Russians. 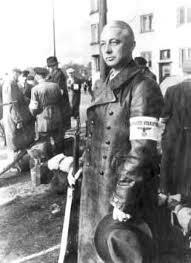 He is seen here with his yellow patch on his arm and second anti-tank rocket around his shoulder. 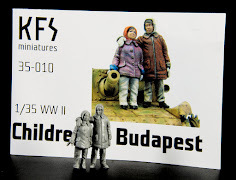 This “Jungfrau” of the BDM is seen in a short jacket over a long skirt – her long pigtails platted over her shoulders and here BDM Haupigruppenfuhrerin badge (OD green on white poplin) placed on her arm – she looks very innocent – but what is she carrying in that bag???? 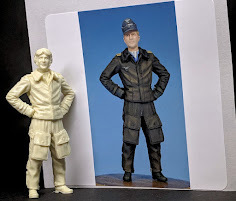 This young man and lady are available as a set at a slightly cheaper price than as a single as well. 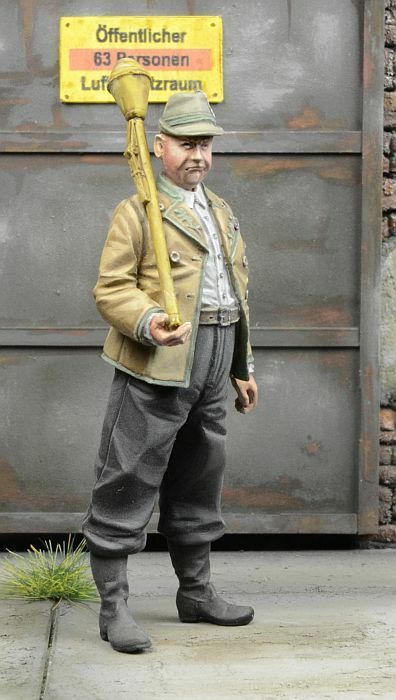 This older chubbier chap looks like he has just got off the train from Barvaria! He is wearing Tyrolean/Bavarian Hat and Jacket. 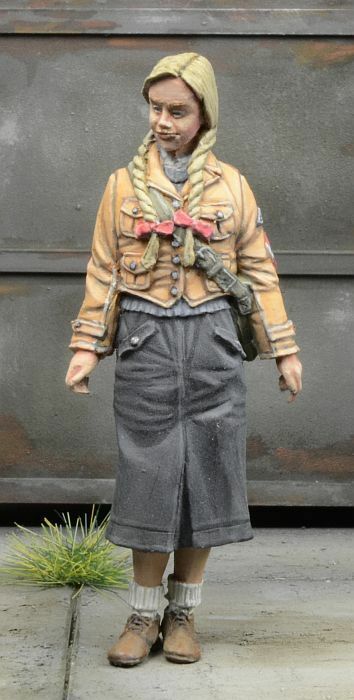 And great boots with thick pants. 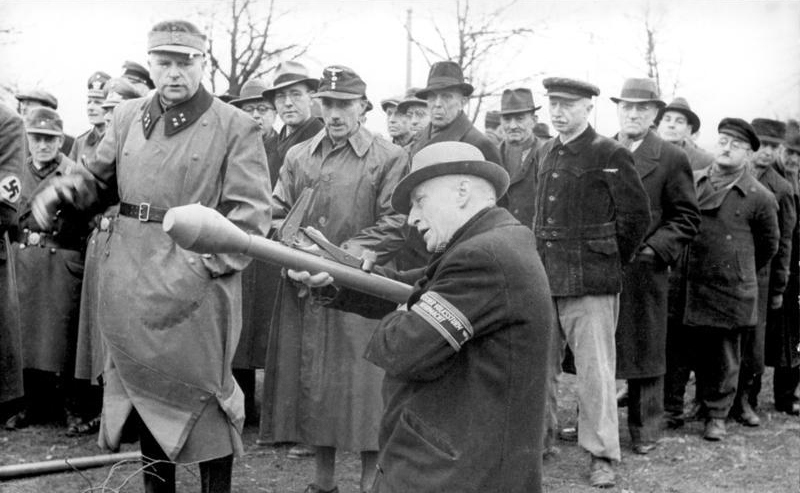 It isn’t just his belly that is packing a punch but his panzerfaust as well! 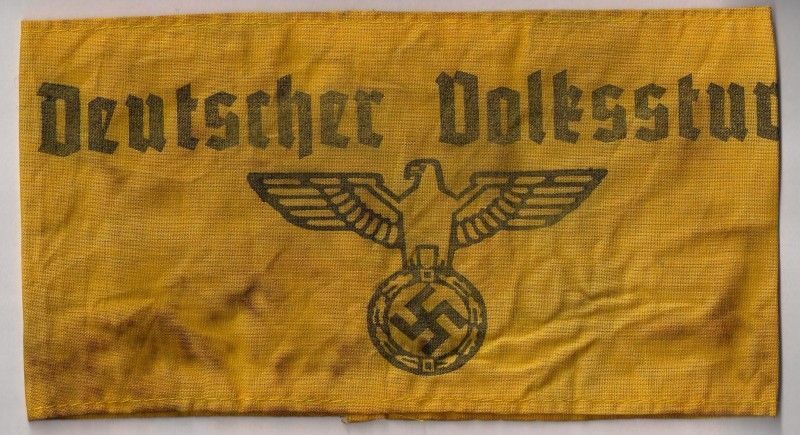 This conscript – who knows how he slipped through the net? 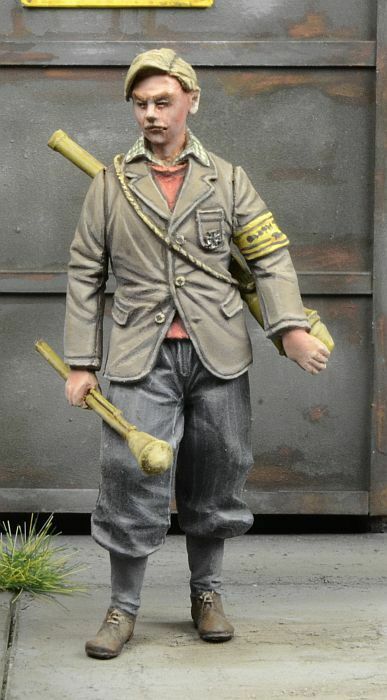 He might have been a soldier of the “Stomach brigade” or some other kind of ailment or even important job that until now excluded him from military service – but here he is – in his long greatcoat with Volkssturm arm band on the sleeve – waiting for the oncoming onslaught. 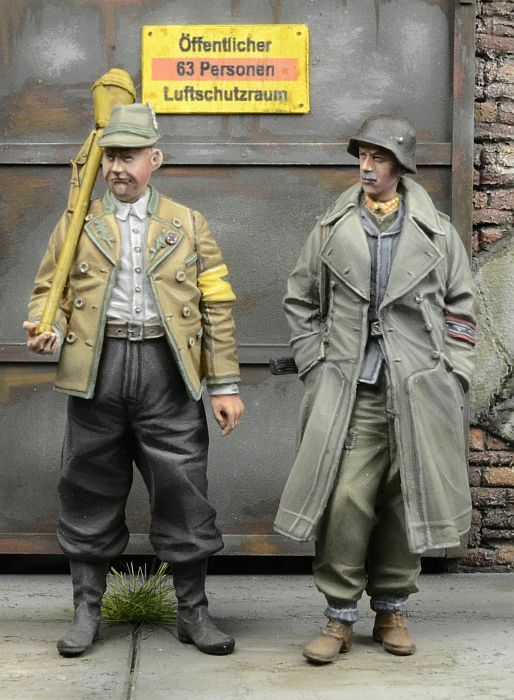 These two old fellers are also sold as a set – waiting around in the last days of third Reich for combat, death, capture or maybe any combination of the three. 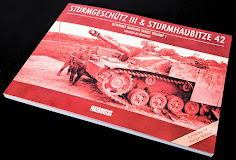 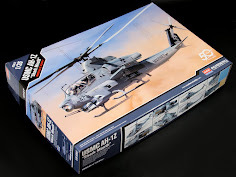 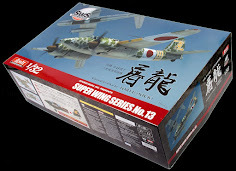 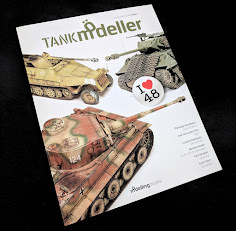 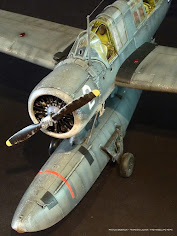 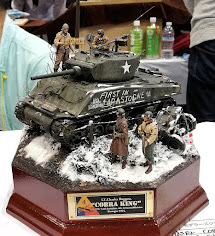 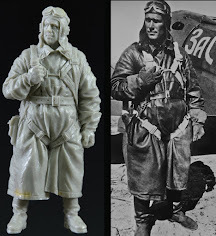 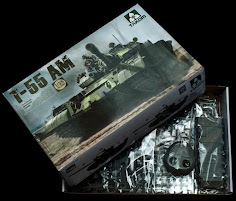 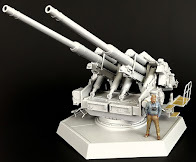 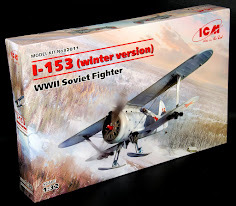 Visit www.ddayminiaturestudio.com for more on all of their figures in both 35th and 72nd scales.